Can you try to answer the following questions? A. In 1950 there were fewer than one billion children (aged 0-14) in the world. By 2000 there were almost two billion. How many do UN experts think there will be in 2100? B. Which map best shows how the world’s seven billion people are spread between the Americas, Europe, Africa and Asia? Each figure represents one billion. C. In the world as a whole, men now aged 25-34 years spent a total of eight years at school. How long did women in the same age group spend at school? D. In the last 20 years, how did the proportion of the world population living in extreme poverty change? These questions were part of a series of questions that the late Hans Rosling would ask audiences of his many talks for many years. The results were not wonderful. How did you do? A. It’s two billion, much the same as in 2000. 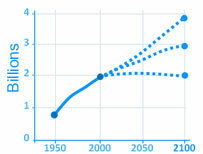 We have, in Hans Rosling’s words, entered the age of Peak Child. When a similar question was put to just over 1,000 British respondents nearly half guessed four billion, and most of the rest guessed three billion. Only 8% selected two billion or less. B. It’s map B. 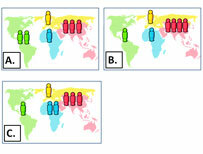 The Americas, Africa and Europe each have a population of about one billion, while Asia’s population is about four billion – in Hans Rosling’s phrase, the Pin code of the world is 1114. Only 35% of British respondents (who were shown four maps rather than three) picked the right one. D. Extreme poverty has almost halved in the last 20 years. It’s one of the great success stories of our age. One billion people still live in extreme poverty, but six billion do not (meaning that they earn more than $1.25 per day). This news had not sunk in for many British respondents – more than half thought extreme poverty had increased in the last two decades. If you got most of these questions wrong then you were not alone. Rosling discovered that leading industrialists, world leaders, academics and many others lacked facts about how our world has actually developed in the past few years and the likelihood of how it will continue to develop in the future. He pointed out in his many talks that if he had given these questions to a chimpanzee and told them to put bananas into an “answer basket” they would randomly have gotten 33% correct. World leaders and academics were well below the chimpanzees! Rosling was able to use his unique presentation style and animated data which was developed by his son Ola and daughter-in-law Anna, to present some very famous “TED” talks that have been seen by millions of people. He fought a campaign to get the world to shake off its ignorance about how the world is and try to understand the great possibilities that we all have for a brighter future. With the help of Ola and Anna, a website was created that shows their ideas and has some excellent teaching resources. This can be seen at the excellent Gapminder website. Hans died last year of Pancreatic Cancer. The last thing that he worked on was a book that he wrote along with his son and daughter-in-law. I have just finished reading it and think it is certainly one of the best and most important books that I have read in a very long time. Bill Gates (of Microsoft fame) is a great enthusiast for the book and has arranged to give a copy of this important book to every U.S. student graduating college in 2018. If you get the chance I would strongly recommend that you read this book. I feel sure that you won’t regret it and know that it will change the way that you look at our world.